The newest and easiest system for all-grain brewing, brought to you by the beer geniuses at Blichmann Engineering! The BrewEasy is a system that combines the quality and efficiency of traditional all-grain brewing with the simplicity of brew-in-a-bag, all in a system with a tiny footprint that can fit in your closet at the end of your brew day. 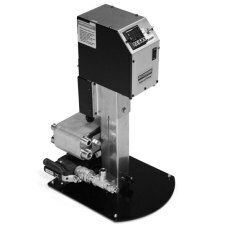 It can be purchased as an all-in-one turnkey system (available in gas and electric), or you can piece it together if you have some existing Blichmann equipment. 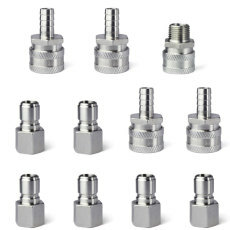 If you already own Blichmann gear, then check out the Adapter Kit for an overview of the different pieces you will need to set the BrewEasy up. The BrewEasy is a revolutionary and ultra-compact all-grain brewing system that provides the simplicity of a brew-in-a-bag (BIAB) system, but eliminates the cloudy wort, messy & heavy lifting, and does it with much better efficiency! 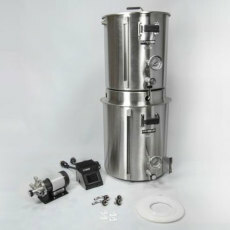 Designed to make all-grain brewing easy, and can fit in your closet when your brew day is done! NOTE: Picture shown is of the G1 BoilerMakers. 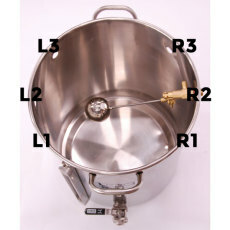 This product will ship with the new G2 BoilerMaker brew pots. The BrewEasy just got better with the introduction of the electric model! The BrewEasy is a revolutionary and ultra-compact all-grain brewing system that provides the simplicity of a brew-in-a-bag (BIAB) system, but eliminates the cloudy wort, messy & heavy lifting, and does it with much better efficiency! Designed to make all-grain brewing easy, and can fit in your closet when your brew day is done. Now with the electric model, you can brew inside the house and escape the cold weather and freezing water hoses. 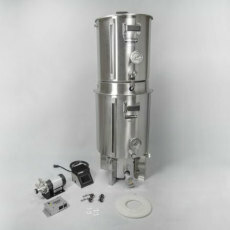 Already have a couple BoilerMakers, but want to upgrade to the revolutionary BrewEasy system? 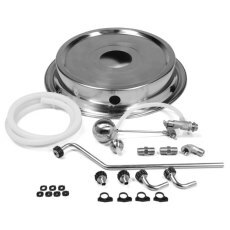 Then you'll need to get this adapter lid kit, which is the core of the BrewEasy Kettle-RIMS system. Each adapter kit is sized specifically for a certain combination of BoilerMaker models (G1 and G2) and sizes. See the detailed description below for additional info. Add this item to your cart if you would like to have a hole punched in your BoilerMaker Brew Pot (also in your cart) for use with the AutoSparge. 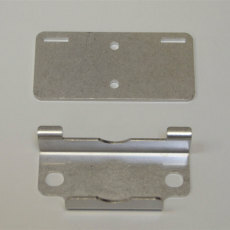 Use the product picture to determine where you would like the hole punch to be placed. Location of the punch does not affect functionality, and is merely aimed at providing flexibility for your given brewing setup. 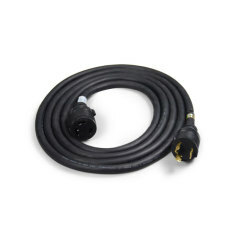 Extension cord (11.5 ft.) for the 240V electric Blichmann Engineering products. Female L6-30R connection on one end, and male L6-30P on the other. If you need extra reach to the power receptacle from your 240V Blichmann electric product, this is the extension cord you need! 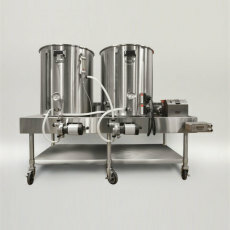 A 20 Gallon horizontal electric BrewEasy system from Blichmann Engineering! Mash, boil and chill, all in one complete system! 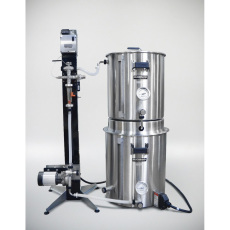 Part of Blichmann Engineering's Pro Series, this system is perfect for home brewing or as a brewery's pilot system! 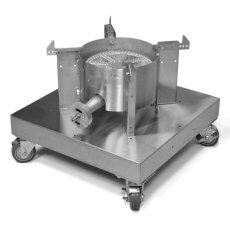 A 1 BBL horizontal electric BrewEasy system from Blichmann Engineering! An easy way to mount your Therminator chiller to your Tower of Power LTE stand. Simple to mount and remove! Makes cleaning and storage a snap! The KettleKart from Blichmann Engineering, is the perfect companion for the BrewEasy all-grain brewing system, or any other setup where a solid, versatile, and mobile cart is desired! This is the 5 gallon 240v electric version of the Blichmann BrewEasy with full Tower of Power Turnkey Kit.